Engineering firm Balfour Beatty has admitted that it breached safety standards before the Hatfield train disaster, in which four people died. The change of plea at the Old Bailey comes after the judge last week threw out manslaughter charges against the company and five rail bosses. Balfour Beatty and Railtrack - replaced by Network Rail - and the executives face health and safety charges. 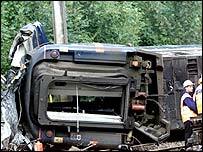 A London-to-Leeds express came off the tracks at 115mph on 17 October 2000. It was derailed by a cracked section of rail. Balfour Beatty had the contract to maintain the track at the time. There is no limit on the fine the company could now face. As the defence case was due to start on Monday, Balfour Beatty's counsel Ronald Thwaites QC said the firm wished to plead guilty to the Health and Safety Act charge it still faced. He read out the basis of the guilty plea, which did not accept all the allegations outlined by the prosecution at the start of the case five months ago. But prosecutor Richard Lissack QC said: "We continue to maintain that in the totality of the indictment this company is guilty." Mr Justice Mackay told the jurors that was "not an issue with which you are now concerned in any way" and instructed them to formally convict the company. He said the cases against the remaining defendants would proceed "in the normal way". "You should not be influenced either way by this change of plea," he told the jury. Railtrack, which owned the East Coast Mainline at the time of the derailment, denies the charge under the Health and Safety Act. Three Railtrack executives - Alistair Cook, 52, Sean Fugill, 52, and Keith Lea, 55 - and two executives from Balfour Beatty - Anthony Walker, 48, and Nicholas Jeffries, 50 - also deny the charge.